PC's Blog: COVER FOR UNTAMED! WOW! Check out the cover for UNTAMED (September 23rd release). What do you think?! Oohh, it's gorgeous! Very nice indeed. :) And I can't wait to read it. It's so like the other book covers but so far from it. I mean it is similar to the other books but more color. hehe. Can't wait to read the book. This is my favorite cover yet! Fantastic looking cover - love the flowing design of the tattoo. I love it but I wish it was coming before October!! I am sure it will be worth the wait but I wish it was out Now!! haha. Great cover! I absolutely love it! Like how there is more to it, then the other covers. I thought the release date was Sept 30th now? Yeah Stephanie thats what it says on amazon. I sure hope it is September 30th! Soooo exciting! Maybe we should have midnight release parties! WOW!! That cover is amazing! I can't wait to get this book!! A midnight release party would be so awesome! I hope they have them everywhere though, if they do do that! And it would be awsome if there were midnight release parties! Like Stephanie said they should be everywhere! want now.... want book now! ahhh!! its coming out on my birthday! I can read it on the plane for my friend planned vegas trip! Wow the new cover is just frexecellent. I don't have any words to describe it. I can't wait for it to come out. Does it come out at the same time in England or later? Sooooo beautiful!! Honestly, as a reader the cover is the icing on the cake and I love this one!! I actually discovered you by admiring the Godess of the Rose cover! All of the cover's are beautiful! Can't wait to see what Zoey gets herself into in this one! Also the new blog design is great too. Looking forward to reading Warrior Rising, I am hoping my copy is in the mail! wow that cover is amazing, maybe its because I love purple, but I think that the girl in the picture looks really beautiful and powerful at the same time, they did a good job. My favorite so far. Gorgeous!! Sheesh. I don't think I can wait till October ! the cover is stunning. i can't wait for the release. i made a countdown of your book! Its here on my blog look! amazing. i love it. just like i've loved every other one before it. and just wondering, but i think i read somewhere that someones making neacklaces like that one on chosen? i could be totally wrong but it would be amazing if someone did! I love the cover art; however, one complaint...While it shows the tattoos on her back (which are fabulous), it doesn't show her facial tattoos. It shows her face where they should be...but they're not there. Unless they disappear in this book...this is a HUGE oversight. Maybe it can be fixed? Its great. I can't wait for the book to come out. Shouldn't there be tattoes on her face though? Guys - I wanted to be sure you knew that St. Martin's moved the release date up to September 23rd! Carol - the YA division of Little,Brown has bought the rights to the first 3 HOUSE OF NIGHT books and they'll be released back to back starting in January. As of right now they haven't purchased UNTAMED yet, so I can't give you a release date...sorry! Nare - no, the tattoos aren't going to be moved to Zoey's face. It would make the cover too busy. Remember that the covers are really just abstract images from the books and aren't literally Zoey. OOOOH! Kristin and I just saw the cover of HUNTED, which will be out in hardback in March! I'll post it as soon as I can, and it is AMAZING! I can't wait for UNTAMED!! The cover is amazing. midnight release party would be awesome! i'll get it the day it comes out either way. 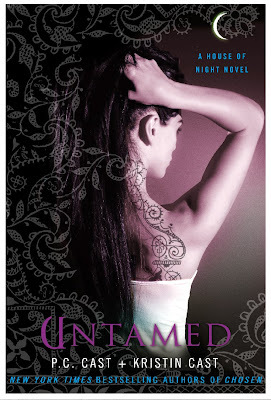 I went to the House of Night Series website and I saw the cover for Untamed! I love it! It's gorgeous! I freaked out for a seconded because I thought it was already out and was about to run to Books-A-Million, haha. That's how much I am anticipating this new book and I love that we can see the tattoos on her back. Its amazing and i abosutley cant wait until it comes out. The series is so awesome!!! Hi there! Just cluing in to the fact that you have a blog (duh! why didn't I think to check before!) and wanted to let you know that I think this is my favourite cover out of all the House of Night books - and they have all had fantastic covers! i love it! her tattoos are so beautiful!!! i cant wait to read it and all the other books i havnt read yet! thanks for writing it! Are any of the House of Night books sold in hardcover? I just bought them in softcover but I hear rumors of harcover ones too! ps- like the untamed cover art!!!!! I love these books so much, I got all my friends addicted too and they know if i don'g read i get into withdrawel. You should make a movie with all this. I would watch it 1,00000 times! Keep writing! Emma Rose - yes, HUNTED, the March book will be out in hardback! Yea! i love the new cover! i read all three books and i read them so quick my mom said she should just return them so i had to tell her i wanted to keep them :) i cried allot when Stevie Rea died :( cant wait to read the fourth! ahh i love itttt! its perfect. I hate Zoey, bot somehow i'm addicted to this series! Maybe it's the entertaining drama. Can't wait to read it! Love the cover art! I am soo in love with the A House Of Night series and am getting the book today!!!!!! I absolutely love the cover!!!!!!!! !Can't wait 2 read what you have in store 4 Zoey this time!!!!!!!!!!!!!!!!!!!!!!! it suits the way you two write, i.m so addicted to the books i keep reading them over and over again but even doing this will not keep me patient for the next book. i'm just too excited to wait. i KNOW it will be worth the wait though. Can you tell me who is the model on the cover of untamed. She is lovely and somehow seems familiar and not just because i've read the book. Which by the way I adore, mostly because the Wiccan teachings are authentic. Thank you.